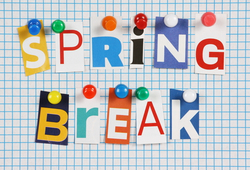 After shorter days and colder weather, you are probably dreaming of enjoying your spring break somewhere warm. Whether you are planning on visiting Orlando with your friends or as a family, it’s never too early to begin preparing for your spring break vacation. In fact, by booking your getaway early, you can help save money, guarantee spots to specific places, and alleviate some stress. Orlando is one of the most popular spring break destinations in the world, don’t let procrastination make you miss out on staying in your ideal location. Also, if you’re traveling with a group of friends, it’s important to keep in mind that coordinating trips can take more time and effort. It’s always a good idea to plan in advance so that each person is prepared and knows what they will need to save for while on the trip. Booking airfare early will help you save money by avoiding the price increases that happen during popular flying times, such as spring break. Based on findings from average prices of flights from March to April in 2017, Skyscanner recommends booking your flight to Orlando 11 weeks before your trip. Although it’s hard to pinpoint the exact time you should reserve your flight, you can be sure that booking it closer to your trip will require you to pay more. Many times less expensive rooms will sell out before the more expensive rooms do. It’s also possible that there will be an increase in room rates during the time you plan on traveling. To ensure you get the best hotel deal, book your stay as early as possible. Some hotels, such as the Rosen Inn International, let you make a reservation up to a year in advance, which means you should have no excuse for not getting a great priced room. When you book your trip early, you can choose to pay for it over time, such as with your flight and hotel stay. By paying for parts of your trip in installments, your payments will be smaller, making paying for the cost of the trip a little less stressful. As soon as your flight and hotel are booked, you can begin preparing for the rest of your trip- whether it’s shopping for essentials, planning trip activities, or hitting the gym. Traveling can be stressful, so it’s important to try and prepare in advance as much as possible to make the most of your time while away. When booking your spring break vacation, choose a hotel that’s conveniently located near all the fun attractions Orlando provides. The Rosen Inn International offers impressive accommodations at a low cost without sacrificing quality or service. Our hotel is not only close to all the action of I-Drive, but offers fun features on-site, such as two seasonally heated swimming pools, a children’s playground, a video arcade game room, a restaurant and lounge, and a fitness center. To book your stay, call us at 407-996-1600 or reserve your room on our website.